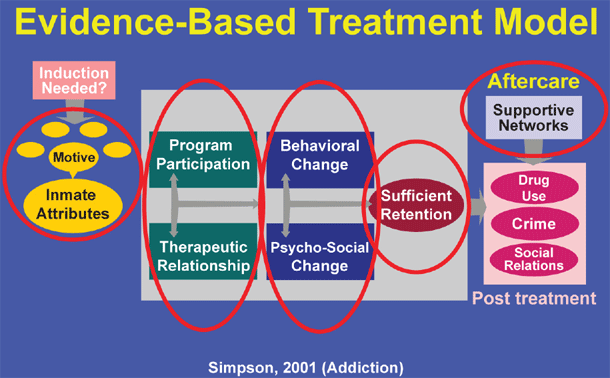 The work of Stanton E. Samenow, Ph.D. has become the foremost "evidence-based" treatment of offenders. With Dr. Samuel Yochelson, Dr. Samenow identified thinking errors and tactics that give rise to behavior that is injurious to others. The Yochelson/Samenow ground-breaking work originated in the 1960's and was developed through that decade well into the 1970's. It was the first cognitive-based treatment of offenders that was developed, and anticipated by many years what would become the accepted practice of cognitive behavioral therapy with a criminal justice population. What Yochelson/Samenow did is transparent, and provides a model systematic approach for others who evaluate and treat the very challenging criminal justice population. The extensive use of Dr. Samuel Yochelson and Dr. Stanton SAmenow's cognitive-based therapy, in all types of treatment settings, has allowed the accumulation of a large body of data with respect to the efficacy of this protocol. Based upon the results achieved by numerous professionals using this therapy, when compared to other treatment methodologies, it is clear that Yochelson/Samenow is the benchmark for evaluation of "evidence-based" treatment programs.